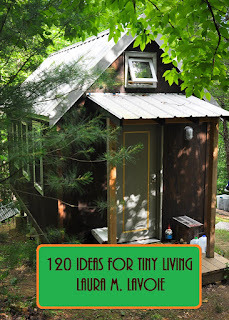 Due to some technical difficulties in the formatting of the book, there will be another delay in the publication of 120 Ideas for Tiny Living. I want this book to be perfect for you so please bear with me in this process. I had originally planned that the book would be out in the Spring of this year. Then editing proved to be a bigger challenge than expected and I pushed it out to Summer. Now, it might be looking like Fall. Please stay tuned for more information on 120 Ideas for Tiny Living. We are all waiting patiently. Have you thought about using some cute, illustrated art for the cover instead of a photograph? I feel that would attract and broader audience and set a more upbeat tone for the book. Because I read a lot of books by independent authors and I'm always drawn to the ones that have a unique or artistic cover. Just a thought. Good luck! I'm still looking forward to it. Publishing a book, whether as an ebook or for print, does take time. Takes me about a month each version, what with all the checking, rechecking, etc. Do what you need. P.S. I love the cover, but might I suggest boosting the font size? On most book sites, you're working with a very small thumbnail. Check out the Tiny House Blog for the article entitled "Things to Think About" as well.